Compatible with any Android™ QuickCharge™ 2.0 device. Includes one detachable micro-USB charging cable. Boost your Android™ phone with up to 8 hours of power in just 15 minutes. Motorola's TurboPower Chargers: Power up without slowing down. Universal. Not just for Motorola. Experience blazing-fast charging with any QuickCharge® compatible device. Fastest on Motorola. Faster everywhere. 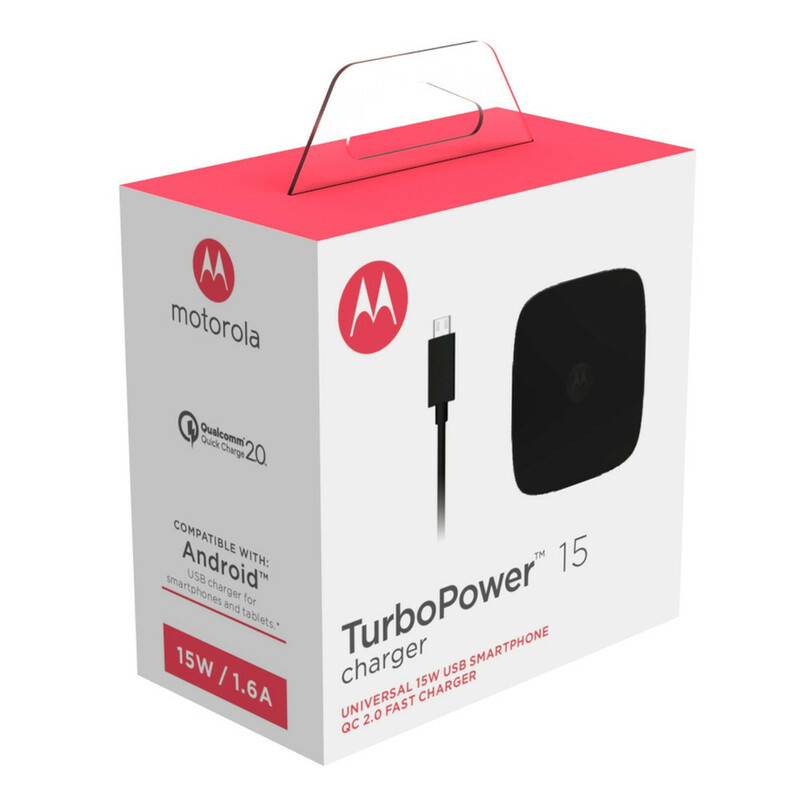 MotorolaChargers.com is the only official online store for Motorola Chargers. It's Turbo. Unbeatable turbo fast charging. Head-to-head comparisons show, TurboPower Chargers deliver significantly more charge in 15 minutes than other chargers. TurboPower uses the phone software to monitor the current state and health of the battery. The software automatically adjusts the amount of charge delivered at every stage, resulting in optimal charging rates from the moment you plug it in. Thermal management is critical to top performance. Prolonged exposure to excessive heat can damage a battery. The TurboPower system is designed to avoid charging slowdowns due to heat, maintaining a steady and fast charging rate. Motorola works with manufacturers to design a custom battery that meets our exact specifications. Only TurboPower starts with battery design to achieve the fastest possible charging and the longest overall battery life. • Charge fast. Over and over. Turbo charge your smartphones and tablets without decreasing your battery’s lifespan thanks to the optimized battery charging algorithm and Qualcomm QuickCharge 2.0 technology. • One for all. Charge any single USB or Micro-USB enabled Android device. TurboPower supports a wide range of profiles that can take advantage of blazing-fast charging speeds. • Charge safely. Rest easy. Get built-in protection from power surges, extreme heat, and other dangers, and know your smartphone or tablet will remain safe while charging. • High Energy Efficiency. Part number SPN5864B with High Energy Efficiency Level VI replaces the discontinued SPN5864A. • Includes a detachable Micro-USB charging cable. You can use it with compatible smartphones, tablets, digital cameras and more. How can I decide which micro-USB charger I should purchase? TurboPower15 or TurboPower25? It depends on the maximum power your device can draw. If your device can only draw a maximum of 15W (for example: Moto G4 Plus), TurboPower15 will be sufficient as the 25W charger cannot provide faster charging. i.e. Your maximum 15W capable phone charges at the same rate using either 15W or 25W chargers. However, if your device can draw full 25W (for example: Moto X Style and Moto X Force), TurboPower25 will be the choice.